Dentistry is the medical field devoted to the art and science of maintaining the health of soft and hard tissues of the oral cavity. Dentistry is not just about filling teeth! Dental procedures are becoming much more sophisticated and involve advancing technology to prevent, diagnose and/or treat periodontal disease, caries, malocclusion and oral-facial abnormalities. Dentists also have the responsibility of detecting head and neck cancer and other mucosal diseases. In addition, more and more research is discovering that there is a strong link between oral and systemic health. Dentists are the directors of the dental health care team which include dental hygienists, dental assistants, and dental laboratory technicians. These dental professionals work together to develop and complete individualized and comprehensive treatment plans for each patient. Dental hygienists work under the direction of the dentist to provide oral hygiene instruction, dental cleanings and related treatments. Dental hygienists are licensed by individual states to treat patients. Most dental hygienists are trained at community colleges and earn associate’s degrees, although there are some bachelor-level dental hygiene programs in the United States. 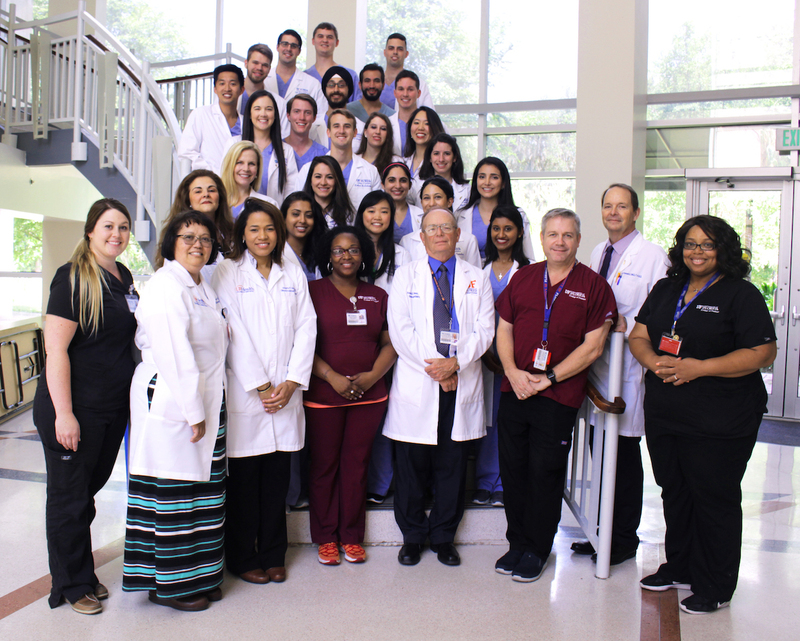 UF College of Dentistry is affiliated with Santa Fe College, which is also located in Gainesville, and has a dental hygiene degree program. Dental assistants work chairside with the dentist to support patient dental care. Dental assistants mix materials, disinfect and sterilize dental instruments, and actively assist the dentist in the treatment of dental patients. 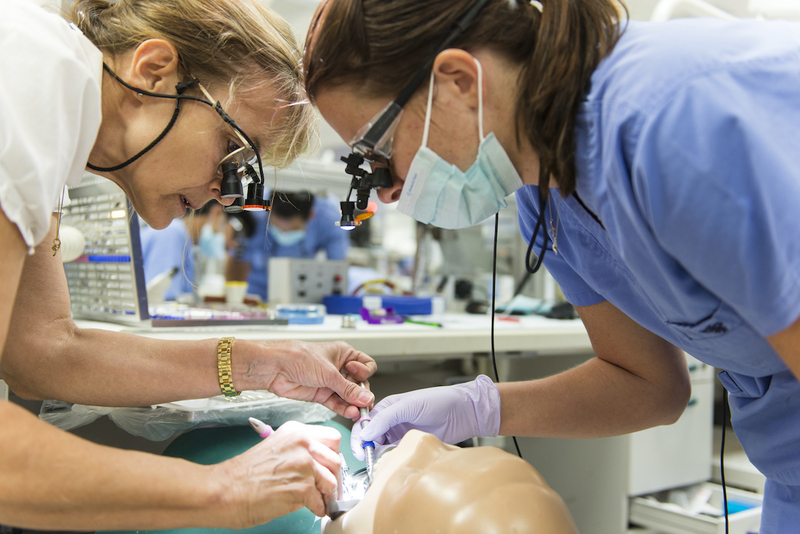 Many dental assistants attend one-year certificate programs at the community college level, although some dental assistants are directly trained by dentists. Dental assistants can become Certified Dental Assistants through a national certification process. Santa Fe College offers a dental assisting certificate program. Dental laboratory technicians work in laboratories to support dental patient care. Technicians make crowns, bridges, implants, dentures and removable prostheses and appliances as directed by dentists. Dental laboratory technicians can receive training through two-year certificate programs at the community college level or be trained on the job. Dentists are usually graduates of colleges or universities with bachelor’s degrees. They study an additional three to four years in dental school, earning either a Doctor of Dental Surgery (D.D.S.) or Doctor of Dental Medicine (D.M.D.) degree upon graduation. Dentists become licensed to practice dentistry in a particular state following a demonstration of their competency through an examination. Completion of a residency program is not necessary to perform all areas of dentistry. In fact, about 80% of dental school graduates become general dentists. A dentist can chose to specialize in a certain field which requires additional training beyond dental school. The length of time required to complete a dental specialty residency program varies among institution, program and specialty. Public health dentists work to improve the dental health of the community through research and service. Dentists specializing in dental public health can be found in academic institutions, the national public health service and in community settings. Endodontists treat problems associated with the pulp tissue located inside the tooth. Also known as root canal specialists, endodontists are experienced with pain control and radiologic interpretation of pathology associated with a diseased tooth. Specialists in oral and maxillofacial pathology are trained in the diagnosis and treatment of diseases of the head and neck, both clinically and microscopically. Dentists rely on them to provide critical diagnostic information through biopsy services. Oral and maxillofacial radiology is the newest recognized dental specialty. Dentists trained in this specialty are skilled in radiologic techniques and interpretation, particularly in the head and neck region. Specialists in this field are important members of the health care team and work closely with other health care specialists to diagnose and treat head and neck disorders. Specialists in oral and maxillofacial surgery are skilled in the surgical treatment of developmental and traumatic injuries to the head and neck. They are also experienced with local and general anesthesia methods and can perform many types of surgical procedures associated with the dentition and associated structures of the head and neck. Many oral and maxillofacial surgery specialists earn M.D. degrees during their specialty training. Orthodontists specialize in the movement and positioning of teeth to create facial and functional harmony. They are knowledgeable about human growth and developmental patterns and are trained to plan treatment at the appropriate stages of an individual’s growth to maximize the results of the orthodontic treatment. Pediatric dentists specialize in the treatment of dental disorders in children. They are specifically trained in the management of children and emphasize prevention of dental diseases. Periodontics deals with disorders of the gums and bony tissue supporting the teeth. Periodontists play an important role in treating and preventing the effects of periodontal disease through surgical and non-surgical treatments. Prosthodontists restore missing or broken teeth with artificial replacements. This can be as little as a partial crown for a broken cusp, or as extensive as prosthetic replacements for missing facial structures lost to disease or injury.